Living off the grid. Being so fed up with how corrupt and dysfunctional modern society seems to be that you just cannot live in it any longer. Deciding to do that and raise your family out there is extreme, but is it crazy? Viggo Mortensen wrestles with his back to basics lifestyle choice in CAPTAIN FANTASTIC. He and his six children are living in the mountains of Washington state. His wife was living there too, but she is dealing with bipolar disorder and is in a hospital. More on her in a moment. The lifestyle is grueling. The children endure physical training and book learning that would be daunting for a college freshman. We soon learn that Mortensen’s wife has succumbed to her demons and has killed herself. Her father (Frank Langella) warns him to stay away from the funeral or he would have Mortensen arrested. Seems the father blames him for his daughter’s illness and death. Mortensen is willing to obey those wishes, but the children want to say goodbye to their mother. Their journey from wilderness to civilization and back to the grid is at the heart of the film. Mortensen wrestles with decisions that go against the fabric of who he is, but may be better for his children. The children seem willing to explore this dangerous world, but he is torn between trying to protect them and knowing that he cannot do it forever. Mortensen is wonderfully maddening. You never know whether to root for him or run up to the screen in an attempt to smack him around. He tries to remain as true to his values as circumstances will allow, but that tears him apart. He is challenged most by his sons. George MacKay is the oldest child and Nicholas Hamilton is the next oldest boy. MacKay is in on the vision to a point, but he wants to go to college and has been accepted by Ivy League schools. Hamilton is rebellious. He doesn’t understand and is always boiling just beneath the surface. Mortensen deals with these conflicts by feeling alternately betrayed and disappointed and angry. He has some understanding, but will he let the children grow beyond his vision. CAPTAIN FANTASTIC is wonderful. Both meanings. Good and full of wonder. Matt Ross wrote and directed. Matt Ross. Silicon Valley fans know him as Gavin Belson. I was blown away. Ross has a deft touch, bringing the right mood to every scene. He gets the balance between comedy and drama just right. He never lets the story go too far one way or the other. And I’m not the only one who thinks so. Ross won Best Director at Cannes. So, ya know…Cannes. 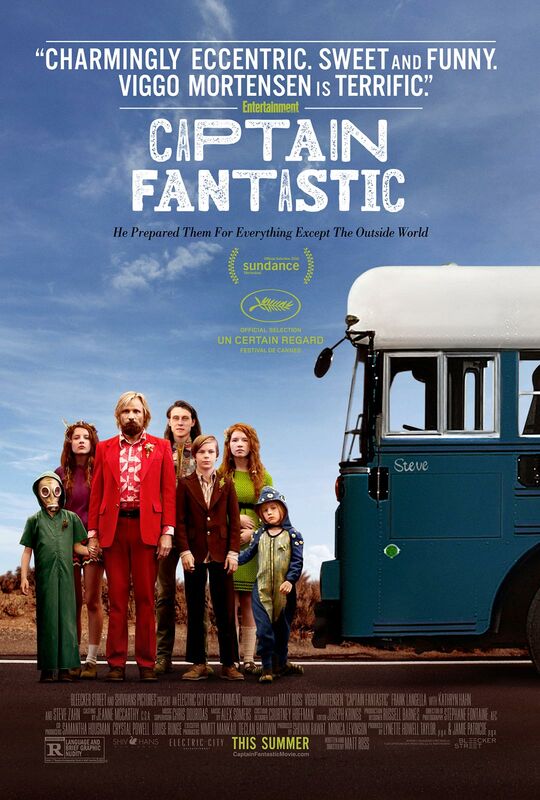 CAPTAIN FANTASTIC is a warm and funny story about family and parenting. One of the best I’ve seen this year.